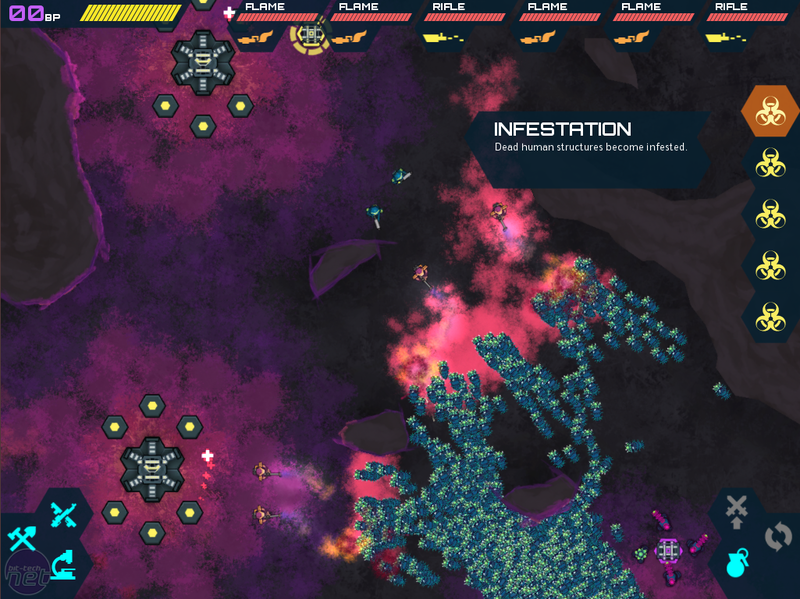 Infested Planet is an upcoming indie RTS from one-man studio Rocket Bear Games, and it's currently in beta. It takes the form of a vicious struggle between an elite team of marines and an unidentifiable alien race on an unknown planet. The infestation itself consists of closely-guarded hive structures, which churn out thousands upon thousands of shuffling worm-like aliens. And in a standard RTS fashion, you take control of your veteran soldiers and proceed to shoot apart, burn down and generally obliterate these hives and replace them with your own bunkers. Thus, saving the world! The game starts off with a number of tutorial missions, which quickly outline the key principles of control and how to succeed. After this, the actual challenge begins. In the lower difficulty stages, such as Tunnels, the aliens are vulnerable, with minimal defences and each hive has only five subsidiary buildings to protect it. These are split between spawners and turrets, which will pour out foes or shoot spit, respectively, at those within range. However, more defensive structures start to appear as you head up to other areas. One of Infested Planet's most appealing features is that each map is randomly generated, and this plays a sizeable role in how much trouble you'll experience. Chokepoints make strangling the enemy advance a simple task, whereas wide open areas will quickly bring out the agoraphobic in you, hitting the Escape button and restarting to get a better map dealt. There's no shame in this; some maps can make winning an exercise in futility. Open fields or not, it's not merely a monotonous trudge from one control point to another. As you take control of the various capture points, occupied by the hives, the enemy will flip out, Evolution-style, and mutate an ability that will either enhance a specific trait or provide a new breed of beast. Don't worry though, there are no dragons. Quick examples of mutations include the Brute type; a heavily-armoured, slow-moving beast which deflects bullets back at your marines. 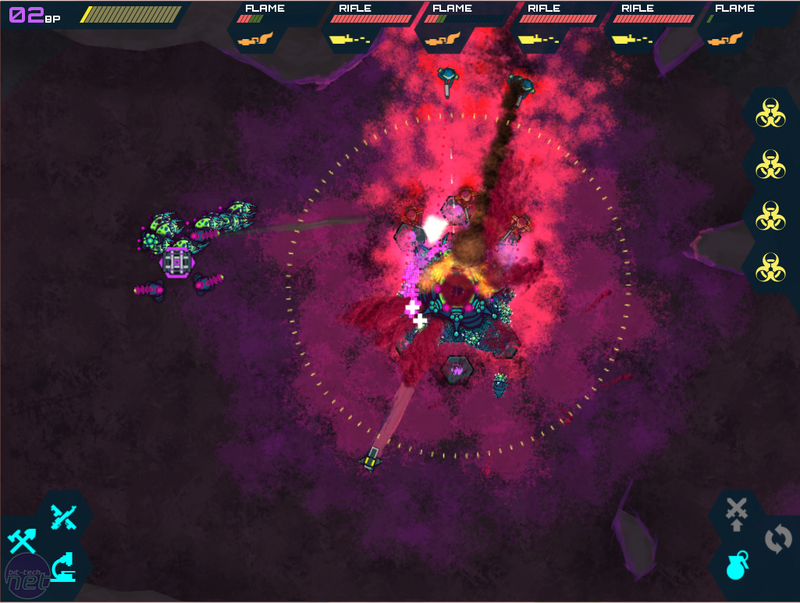 There's also the Impact ability, which will cause turrets to push back your marines when they get hit. The adaptive measures taken by the aliens are myriad and each provides its own obstacle to work around, or rather, to work against. Fortunately, mutations in the earlier stages are few, and naturally you're not left without your own advancements. Your improvements take one of three forms: buildings, soldier types and general abilities. Build Points (BP) are gained from conquering hives (or retrieving supply crates) and can be exchanged for these upgrades. So, while you may start with five simple riflemen, you can upgrade them to instead use fusion shotguns, sniper rifles, miniguns, flamethrowers and grenade launchers. Alternatively, you might free up your defending troops by building defensive turrets. Build Points are also refundable, affording you your own measures of adaptability. Chief among the toys in the box of destruction are the grenades. Yes, our cherished friend from every FPS makes a special appearance. These are available from a very early stage and enable you to make use of the Assault tactic, which will highlight a circular area where you marines will, if possible, throw grenades at enemy structures. Grenades require the use of Ammo Points (AP), which replenish over time, but offer the perfect disposal service for small buildings. Many of these upgrades are unavailable at the start but, as you advance and replay through the stages, you will garner sufficient funds to purchase the technology from the research panel in the main menu. Once an advance has been purchased, it will be available for BP on the battlefield. While earlier areas, such as the Lowlands and Tunnels, provide low cash amounts, the more advanced areas, such as The Grotto, give significantly more, providing quicker access to better equipment. You will definitely need those options open to you when you reach The Ruins and The Abyss (the two hardest stages).